“Reply 1988” is sadly nearing its end, and as predicted there was a time jump (ep. 17) leaving fans eagerly anticipating the next episode. ‘Reply 1988‘ releases an adorable behind the scenes video with Hyeri, Ryu Jun Ryeol and Park Bo Gum. ‘Reply 1988‘ star Go Kyung Pyo poses for the latest issue of ‘InStyle‘. Breakout newbie actor Ryu Jun Yeol, steals the viewers hearts with his role in drama “Reply 1988“. The actor grabbed the viewers hearts with his irresistible charms in the role of Jung Hwan, one of Deok Sun’s best friends and her possible future husband. The popular drama is known for its brilliant production, launching the careers of many breakout stars, as well as its fans raging shipping wars over ‘who’s going to be the husband’. Ryu Jun Yeol’s character already has a great mass of viewers rooting for his love-line. “Reply 1988” cast members Ryu Jun Yeol and Ryu Hye Young posed for the December issue of ‘@Star1‘ magazine. November will bring a lot of fun with all different comedies, from sweet romantic comedy to youth and family comedy. Upcoming drama “Reply 1988” dropped first teasers featuring leading lady Girl’s Day‘s Hyeri. 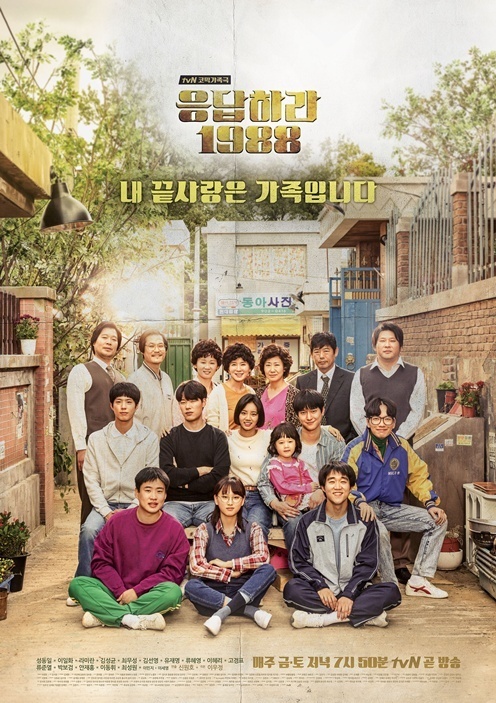 Upcoming tvN drama “Reply 1998” (Answer Me 1988) releases nostalgic era poster and first teaser.